Can the current iteration of global capitalism be reformed, or is it poised to be replaced by some other mode of production? Judging by the mainstream media, the most pressing problems facing capitalism are 1) income inequality, the basis of Thomas Piketty’s bestseller Capital in the Twenty First Century, and 2) the failure of laissez-faire markets to regulate their excesses, a common critique encapsulated by Paul Craig Roberts’ recent book and 2) the failure of laissez-faire markets to regulate their excesses, a common critique encapsulated by Paul Craig Roberts’ recent book The Failure of Laissez Faire Capitalism. The proposed reforms align with each analyst’s basic ideological bent. 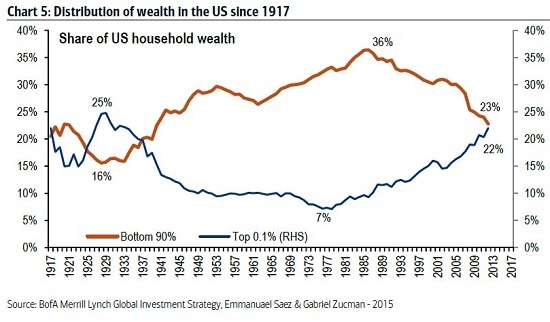 Piketty’s solution to rising wealth inequality is the ultimate in statist centralization: a global wealth tax. Roberts and others recommend reforming capitalism to embody social purpose and recognize environmental limits. Exactly how this economic reformation should be implemented is a question that sparks debates across the ideological spectrum, but the idea that capitalism can be reformed is generally accepted by left, right and libertarian alike. Socio-economist Immanuel Wallerstein asks a larger question: can the current iteration of global capitalism be reformed, or is it poised to be replaced by some other mode of production? Wallerstein and four colleagues explored this question in Does Capitalism Have a Future? Wallerstein is known as a proponent of world systems, the notion that each dominant economic-political arrangement eventually reaches its limits and is replaced by a new globally hegemonic system. Wallerstein draws his basic definition of the current dominant system—let’s call it Global Capitalism 1.0—from his mentor, historian Fernand Braudel, who meticulously traced modern capitalism back to its developmental roots in the 15th century in an influential three-volume history, Civilization & Capitalism, 15th to 18th Centuries. From this perspective, there is a teleological path to global capitalism’s expansion beneath the market’s ceaseless cycle of boom-and-bust. This model of ever-larger systems of global dominance has been further developed by Braudel disciples such as Giovanni Arrighi ( The Long Twentieth Century: Money, Power and the Origins of Our Times). Amidst the conventional chatter of social spending countering markets gone wild--as if the only thing restraining rampant capitalism is the state--Wallerstein clearly identifies the state's role as enforcer of private cartels. There is not just a function of regulatory capture by monied elites: if the state fails to maintain monopolistic cartels, profit margins plummet and capital is unable to maintain its spending on investment and labor. Simply put, the economy tanks as profits, investment and growth all stagnate. This is why Wallerstein characterizes this iteration of capitalism as "a particular historical configuration of markets and state structures where private economic gain by almost any means is the paramount goal and measure of success." Even those who reject this left-leaning description of free markets and the self-interested pursuit of profit can agree that the prime directive of capitalism is the accumulation of capital: enterprises that fail to accumulate capital lose capital and eventually go bust. As economist Joseph Schumpeter recognized, capitalism is not a steady-state system but one constantly reworked by “creative destruction,” the process of the less efficient being replaced by the more efficient. Though the status quo believes that amending the political-financial rules is all that’s needed to maintain the current centralized arrangement, Wallerstein believes that following the old rules will actually intensify the coming structural crisis. Piketty’s analysis offers a ripe example of the belief that the old rules are sufficient. To Piketty, capital’s ability to expand at faster rates than the underlying economy (as measured by GDP) has lashed the tiller on a course to rising inequality, and the only way to ameliorate the resulting social instability is to redistribute the wealth via state-mandated taxes. The other systemic threat is what Mann characterizes as “the treadmill of the nation-state’s obsession with growth.” The environmental degradation resulting from increasing consumption is jeopardizing the global system’s ability to stay on this GDP-focused treadmill. One need only glance at photos of choking smog in Beijing and New Delhi to grasp Mann’s point. If the arrangement between these institutions changes radically enough, Mann envisions the possibility that the structural crisis “will stabilize into an enduringly low-growth capitalism,” a possibility with historical precedents such as 18th century Britain. But this rosy outcome ignores the book’s key thesis that the foundations of the current system have no future because they’ve reached intrinsic limits: the returns on following the old rules are increasingly marginal. Financialization has run of out of assets to leverage into financial bubbles (what’s left to leverage--bat guano? ), the middle class that has paid for its ever-expanding consumption with rising wages is in structural decline due to the displacement of human labor by software, and the state’s ability to manage structural crises while protecting global cartel profits is being undermined (in Wallerstein’s analysis) by the ever-rising costs of providing healthcare and income security and paying the external costs of environmental damage. The old rules--inflating another credit bubble to bail out an insolvent financial sector, increasing taxes on the remaining employed, further centralizing authority and control--are no longer working; as Wallerstein observed, these are actively intensifying the structural crisis. Wallerstein and his colleagues did not address another possible future, one that does more with less, an economic philosophy that rejects GDP as the arbiter of nation-state success and embraces the principles of the Degrowth movement (décroissance in French) that is gaining adherents in the developed world. In Japan, proponents speak of the de-Generation that is pursing Degrowth, de-materialism and de-ownership: advancement and success arise not from consuming more resources and capital, but by using fewer resources and less capital in pursuit of a more fulfilling, lower-impact lifestyle. Piketty and Wallerstein alike overlook Nassim Taleb’s diagnosis of what’s wrong with the current state-capitalism. In Taleb’s view, wealth inequality arises not from capital’s expansion but from the state’s transfer of risk from private speculation to the public sector. As the financial crisis of 2008 illustrated, the state protects financial capital from losses and inflates asset bubbles that provide outsized returns for those with access to cheap central-bank credit. Wealth inequality is generated not by intrinsic features of capitalism--the most important of which, in Taleb’s view, is that every participant has skin in the game, i.e. is exposed to the losses that go hand in hand with risk—but from specific state/central bank policies that reward leveraged speculation and enable financiers to play with no skin in the game. Wallerstein and Piketty also overlook the transformative power of the factors Arrighi identifies as the key drivers of capital accumulation: attracting entrepreneurs and mobile capital. What could replace the current iteration of global state-capitalism? If we assemble these three potentially transformative dynamics--Degrowth, the recoupling of risk and loss and entrepreneurial mobile capital--we discern a new and potentially productive teleological arc to global capitalism, one that moves from a capitalism based on hyper-centralization and obsession with rising consumption to a new capitalism focused on more efficient use of resources and capital via decentralization and localized innovation. Rather than ask if such a “think globally, profit locally” alternative is possible, we might ponder the sobering conclusion that that current system of Global Capitalism 1.0 will be replaced with some new arrangement one way or another, and we might as well choose the more efficient, adaptive and sustainable decentralized model rather than go down with the statist-steered "the only solution is increased centralization" ship. This essay was first published in The American Conservative magazine. Thank you, Daniel E. ($5), for another splendidly generous contribution to this site-- I am greatly honored by your steadfast support and readership.